Yellowstone National Park experienced the second busiest year on record in 2017. The park recorded 4,116,525 visits, a decrease from 2016. Last year was a record year for visitation with 4,257,177 visits to the park. • How can the park prepare for a future in which visitation continues to increase? • How does the increased visitation affect park resources and visitor experiences? • What do people expect when they come to Yellowstone? • How do people move through the park? 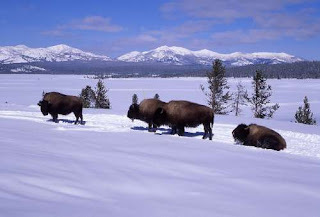 Yellowstone is a place known and loved by local, regional, national, and international visitors. In this era of increased visitation, park officials remain committed to preserving Yellowstone’s resources and the experience of people who come here. Continued high levels of visitation at Yellowstone remind visitors how important it is to plan your visit. More visitation statistics are available online at https://irma.nps.gov/Stats/Reports/Park. On the morning of January 16, 2018, park staff discovered 52 bison, held at the Stephens Creek facility for possible quarantine, had been released from the pens. The National Park Service has initiated a criminal investigation of this incident at the Stephens Creek facility in Yellowstone National Park. Anyone with information about this incident is encouraged to call the Yellowstone National Park Tip Line at 307-344-2132. For more information, visit http://go.nps.gov/tipline. Grand Teton National Park’s 2017 visitation set a record for the fourth consecutive year. The park received over 4.9 million total visits, a 3 percent increase from the previous record set in 2016. Visitation reached monthly records in June, August, September, and October. August, which included the total solar eclipse viewable from throughout the park, had 65,000 more visits than the previous record August of 2015. The record visitation is part of a longer term upward trend which has seen park visitation increase by over 1 million visits, or 27 percent, during the past five years. The record is also part of a nationwide trend which has brought record numbers to national parks across the country. The busy year for the park was highlighted by the total solar eclipse on August 21. The park saw a significant increase in visitation on the days leading up to the eclipse, as well as the day following the event. Park managers estimate the long weekend was the busiest period in the park’s history. Park concession-operated campgrounds were near capacity, and for the first time in park history, all backcountry permits were issued for three days straight. Visitation numbers are derived from traffic counter data. The numbers recorded by these counters are run through an algorithm to determine an estimated visitation number. The methodology has been consistent since 1992, which allows park managers to compare visitation levels from year to year. In addition to the total visitation number, park traffic counters also calculate a “recreational visitation” statistic which excludes most traffic on U.S. Highway 26/89/191. In terms of recreational visitation, the park received 3.3 million visits in 2017, 1 percent more than the previous record number the park received in 2016. For more information about visitation statistics and how they are calculated, visit https://irma.nps.gov/Stats/Reports/Park. For more information about hiking in Grand Teton National Park, please click here. Encompassing more than a million acres, Glacier National Park in northwestern Montana is home to some of the most beautiful alpine meadows, lakes, pristine forests, rugged peaks and glacially-carved valleys in the world. 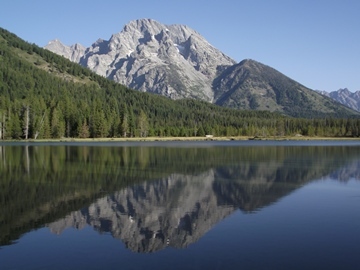 Its diverse habitats support nearly 70 species of mammals, including grizzly bears, black bears, mountain goats, bighorn sheep, moose, wolverines, gray wolves and mountain lions. 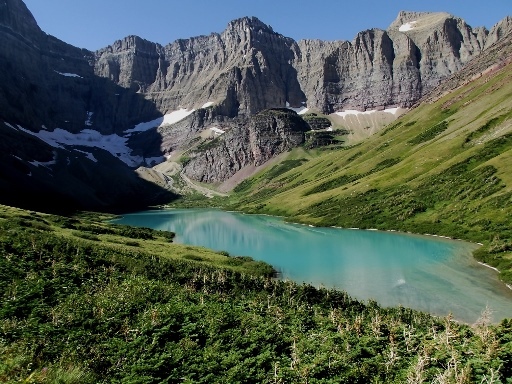 With more than 740 miles of trails leading to some of the most spectacular scenery on the planet, Glacier is also a hiker's paradise. Considering its massive size, most people divide the park into sections in order to focus on one or two areas at a time. 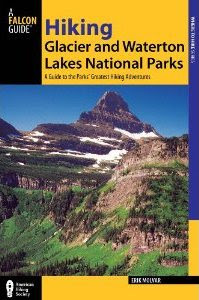 The four most popular areas in the park are West Glacier and Lake McDonald, Two Medicine, Logan Pass, and Many Glacier. The following are a few suggestions for day hikes in each of these areas. Although not quite as popular as some of the other areas in Glacier, the Two Medicine Valley in the southeast corner of the park still offers some incredibly beautiful scenery. One of the best hikes in this area leads to Scenic Point. This rock outcropping, which sits above an alpine tundra meadow, offers panoramic views of much of the entire Two Medicine Valley. On a clear day you can even see the Sweet Grass Hills rising above the Great Plains roughly 90 miles away! The most well-known backcountry hike in the Two Medicine area is Dawson Pass. Although this route usually gets most of the attention, I think the views from Pitamakan Pass are much more dramatic. From the knife-edge ridge you can see five cobalt-blue lakes on either side of you. Can’t decide on which one to hike? The two passes can be combined to create one epic day on the trail. One of the most popular destinations in the park is Many Glacier. Classic hikes such as Iceberg Lake and Grinnell Glacier get most of the attention; however, there are two other destinations that shouldn’t be overlooked, especially if you’re seeking a degree of solitude in this stunning valley. One of these is Ptarmigan Tunnel. The highlight of this hike is passing through a 240-foot tunnel that was cut through Ptarmigan Wall. The tunnel was built by the Civilian Conservation Corp in the 1930's so that visitors on horseback could pass over into the remote Belly River area. After hiking all day in the Many Glacier Valley, walking to the other side of the tunnel is like walking into another world. The views from the other side are simply stunning. The other destination, Cracker Lake, has to be one of the most beautiful lakes in the world. It has the most beautiful turquoise color you could ever imagine. If it were possible to ignore the magnificent scenery of the surrounding mountains, it would still be well worth the 12.6-mile roundtrip hike, just to see the amazing color of this lake. Cracker Lake’s deep shade of turquoise is the result of light refraction through its suspended load of glacial silt. For more than a century one of the things that has made hiking in Glacier unique are its two Swiss-style backcountry chalets: Granite Park and Sperry. The Granite Park Chalet can be reached by taking the epic Highline Trail from Logan Pass, or by taking the 4.2-mile climb from The Loop area on the Going-to-the-Sun Road. Unfortunately the historic Sperry Chalet dormitory building was severely burned during the summer of 2017. Fortunately the outer stone structure survived, and as of right now, the park is moving forward with the possibility of rebuilding the lodge. Moreover, the historic dining room survived, although it’s not clear as to whether that will reopen for lunch to day hikers in 2018, nor is it clear as to how far hikers will be able to travel along the Sperry Trail, as there will be several thousand dead fall trees that will need to be removed before the trail is reopened. When reopened, the 6.1-mile hike from the Lake McDonald Lodge passes through Glacier Basin where hikers will enjoy views of several waterfalls flowing hundreds of feet down the cliff walls that surround the alpine meadow. From the same trailhead is the hike that leads to the historic Mt. Brown Fire Lookout. The trail climbs 4250 feet in only 5 miles, making it one of the toughest day hikes in the park. The elevation gain is similar to the amount gained on many of the trails leading to the summits of 14,000-foot peaks in Colorado. However, at a much lower elevation, hikers will have far more oxygen to breathe. From the lookout the views into the heart of Glacier are simply amazing. For a much easier hike, but one that still includes stunning scenery that Glacier is famous for, be sure to check out Avalanche Lake. over a six-foot wide ledge for roughly one-quarter of a mile. One false move and your next stop will be on the pavement of the Going-To-The-Sun Road - more than one hundred feet below. Fortunately the park has installed a hand cable along this stretch of the trail. My advice is to not let this deter you, as this is one of the most scenic trails in America. Almost 99% of the Highline passes through open country, so there's never any dull scenery on this hike. The trail is also famous for wildlife, especially bighorn sheep and mountain goats, which are frequently seen just off the side of the trail. 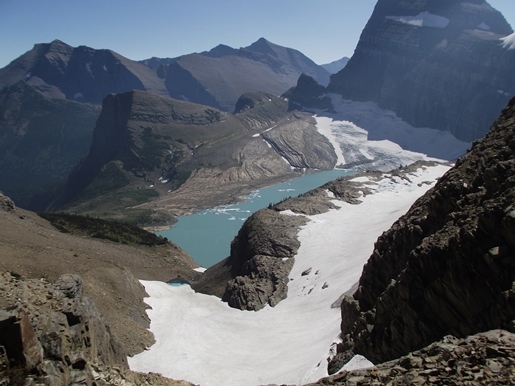 Hikers will have the choice of taking the moderate hike to Haystack Pass, or the extremely strenuous hike up to an overlook along the crest of the Continental Divide which offers stunning views of Grinnell Glacier some one thousand feet below. This just might be the best view in the park. Just a notch below the Highline Trail on the “awesome meter”, but far less crowded, is Piegan Pass. The trail offers mind-blowing views of mountains, glaciers, alpine meadows and an up-close view of the Garden Wall, a glacially-carved arête that marks the Continental Divide. 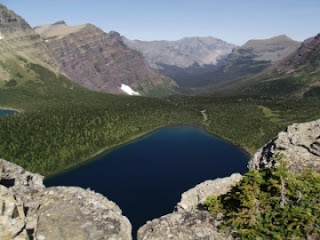 Near Piegan Pass, and one of my absolute favorite areas in Glacier, is Preston Park. In the early summer, after the snow finally melts, this incredibly beautiful alpine meadow becomes a carpet of wildflowers. 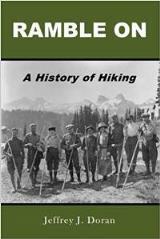 For more information on all these hikes, and many others throughout the park, please visit HikinginGlacier.com. A red fox, which had received numerous food handouts from people in Grand Teton National Park, was put to death recently. The fox exhibited bold behavior by approaching people and vehicles in search of food, and was killed out of concern for human safety. Visitors are reminded that feeding park wildlife is illegal, and may ultimately lead to the death of an animal or injury to park visitors. “Destruction of a wild animal is one of the most difficult actions we have to take as park stewards,” said Superintendent David Vela. “Hopefully this can serve as a cautionary reminder. I encourage everyone to help protect wildlife by securing food sources, including dog food and fish scraps, and by using the ‘Scare, don’t stare’ tactic to discourage approaching foxes.” Vela added that visitors can help hold each other accountable and should immediately report incidents of animals being fed to Teton Interagency Dispatch Center at 307.739.3301. Evidence suggests there has been a marked increase in the population of red foxes in recent years. Accompanying the apparent population increase, biologists have documented increasing numbers of habituated and food-conditioned foxes. The small native animals have been observed begging for food in developed areas and harassing ice fisherman on Jackson Lake. The rise in human-fox encounters spurred biologists to begin a red fox research project in the winter of 2016-2017. The goal of the study is to improve understanding of red fox ecology and to address management concerns related to human safety and wildlife health. To date, 13 foxes have been captured and tested for disease prevalence, genetic lineage, and use of natural and human foods. Some of these foxes have been fitted with radio collars to track movements and habitat use, locate dens, document reproductive success, and follow other trends. One of these collared foxes, a two- or three-year-old male, was known to frequent the Jackson Lake Dam and Signal Mountain areas. Reports involving this individual over the last year include lingering around ice fisherman and receiving fish scraps as well as getting into dog food left unsecured by visitors in a campground. In recent weeks, park staff received numerous reports of the bold fox approaching visitors in the dam parking lot, and in at least one instance jumping up on a vehicle to beg for food. On December 28, park biologists observed the fox for two hours as it continually walked in front of moving vehicles, approached vehicles and people, and loitered in the roadway. The biologists were also told the fox had been fed grapes by a visitor the previous day. The fox was captured, immobilized, and transported to a location away from visitors to be dispatched. The fox was of a normal healthy weight, and samples were taken to determine its dietary composition. Relocation of the fox was considered, but ultimately dismissed, as relocated foxes typically continue to beg for human food in a new area, return to their original territory, or die due to starvation or competition with other territorial foxes. The “Scare, don’t stare” tactic includes yelling, clapping, stomping, and avoiding eye contact in an effort to dissuade foxes from approaching humans. The tactic should only be employed after attempts to maintain a minimum viewing distance of 25 yards have failed. It should not be used with foxes that behave naturally.